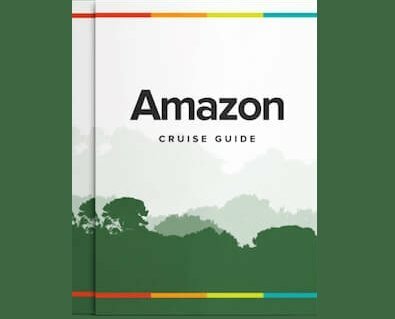 We classify the Rio Amazonas Amazon Cruise as a historical Amazon cruise on account of her fascinating history. The Rio Amazonas is the sistership to the Clavero, another historic ship operated during the Rubber Boom Era. The Rio Amazonas is equipped with 15 air-conditioned cabins, each with two single beds, wardrobe, private bath and shower. She does not have hot water, but in our experience, when returning from excursions, passengers are usually quite eager for a cool, refreshing shower. The Rio Amazonas Amazon vessel is a cozy expedition cruise ship navigating in the Peruvian Amazon measuring 44 meters long and 9 meters wide. A comfortable, communal dining hall is where cruisers enjoy well-cooked, local and international meals prepared by local staff. In the evenings, passengers can enjoy the upper deck and enjoy the sunsets. History buffs must join in on the educational talks in the lounge. If Dr. Richard Bodmer is onboard, you're in for a treat! The Rio Amazonas was built on the Clyde, Scotland by Murdoch & Murray in 1899 as a rubber transport steamship for the Amazon. The Rio Amazonas was commissioned by the firm Miranda & Co. of Belem do Para, which is the city located at the mouth of the Amazon River in Brazil. In 1907 she was bought by Braga Sobrinho & Cie and named ‘Braga Sobrinho’. Adolfo Morey Arias, one of the most successful rubber barons on the upper Amazon purchased her in 1936, changed her name to ‘Arias’, and brought the ship up to Iquitos, Peru. The ‘Arias’ navigated the route from Iquitos to Belem as a cargo and passenger ship travelling over 2,000 miles to the mouth of the Amazon. In the early 1980’s the ‘Arias’ was converted to a tourist boat and her name was changed to ‘Rio Amazonas’. The ‘Rio Amazon’ was one of the largest riverboats on the Peruvian Amazon measuring 44m long and 9m wide. The ship was converted from steam to diesel in the 1970’s and purchased by Amazon Eco in 2010 as a research ship. Now, the ‘Rio Amazonas’ joined the Historic Boat Museum fleet, sister ship to the Clavero, as a navigating ship travelling to the Pacaya Samiria National Reserve. Please note there is a minimum of 9 passengers required for a departure to be guaranteed.